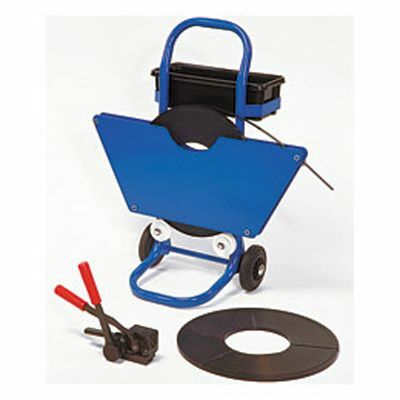 Designed for faster heavy duty application, this kit includes a sealless combination tool which saves valuable time when compared to interchanging separate strapping tools and applying seals. 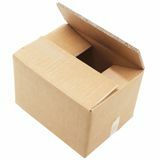 Simply place on top of the crate or carton and feed through the ends of the steel strapping. 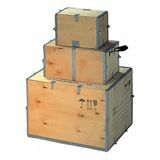 Steel Strapping Dispenser- this heavy duty, steel dispenser has a similar tilt and wheel design to a sack truck to enable you to transport your strapping around the workplace with ease (ref GDSS1). Heavy Duty Sealless Combination Tool- This rugged combination tool quickly and efficiently tensions and seals steel strapping without the need for separate tools or metal seals. Available in 3 models to suit your strapping width (GSC3/13, GSC3/16 or GSC3/19).